SAL DeTRAGLIA'S VIRTUAL TAPAS BAR: UNSOLVED MYSTERIES. Spanish homes have three common traits: (a) terra cotta roofing tiles; (b) plastered stucco walls; and (c) a water-filled Evian® bottle strategically-placed before the front door. This latter point has perplexed me for years. I’ve observed this bizarre sociological phenomenon in dozens—perhaps hundreds—of Spanish homes. I’ve seen it in Barcelona. I’ve seen it in Alicante. And as the photo above attests, I saw it this morning in Cabanillas del Campo. Some folk take it a step further, and place a bottle in front of each basement window. But, why?! I’ve analyzed it from every conceivable angle…yet still cannot rationalize it. * Are these bottles a humanitarian offering to thirsty Bedouins that pass in the night? I doubt it. One rarely sees camels roaming the streets of Spain, except during Three Wise Men’s Day parades—and even then, I’m fairly certain that those men on camels have had plenty to drink already. * Do they function as an early warning system for seismic activity? Perhaps slight ripples in the bottles’ water means that tectonic plates are shifting. Nah. Spaniards aren’t concerned about the forces of nature, unless a soccer game is at stake. * Could it be voodoo? Perhaps these bottles threaten door-to-door salesmen with a frightening curse. If your knuckles so much as touch that door, you WILL retain water. So…I am forced to ask you—the readers—to help me crack this case. 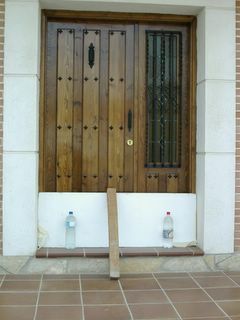 Does anybody know why Spaniards put bottles of water before the front doors of their homes? Hi, long-time listener first-time caller. Maybe they are from the water fairies? Like we have the milkman here in the UK - that wonderful chap who gets up at some incredible hour just to leave 2 pints (sorry - 1 litre - I am British you know) of milk on our doorstep in time for breakfast. At least, I assume it's some wonderful chap - I never see him. We put the money out once a fortnight and the milk keeps a-comin' - maybe it's like the tooth fairy in reverse. Perhaps Spain IS crawling with "water fairies." I have a vivid image in my mind. Dozens of synchronized swimmers--complete with bathing caps, nose plugs, and enormous smiles plastered across their glistening faces--bounding throughout Spain in formation and depositing water bottles on select doorsteps. I must admit that on certain mornings, I do detect a whiff of chorine when I first open my front door. If your theory proves accurate, then you will receive an all-expenses paid lunch at my next door neighbor's house--as soon as they leave for extended holiday. As for your analogy between milkmen and the tooth fairy, I have doubts. Demographically speaking, I'd wager that milkmen have very few teeth. Perhaps that's why they work at night. And last but not least, thanks very much for your compliment...and for being a long-time listener...and for posting a comment. Welcome! Imagine you're the average Spaniard (1.70 metres -some 5 feet- Aznar-looking). Its 3 pm (bedtime in Norway, lunchtime in Spain) and you look for a suitable place to eat your wonderful bocata. You also have your bottle of water to drink. You would sit down at someone else's entrance (in the shadow) and... munch, munch, eat your sandwich. Once your lunch is finished, you'd probably light a cigarette. After that, it's time to go back to work. You stand up and leave... leving the bottle, the bag of the bocata and the cigarette end behind you. Lunch? Water for lunch? In Spain? Granted, every Spaniard drinks water for lunch...but only insofar as it's an integral component of the beer-brewing/wine-fermenting/whisky-distilling process. BTW...I have a Norwegian friend who'd like to have a word with you. Okay, call me crazy but the water seems to be only part of the mystery in this photo. You are neither crazy nor a fool. There is indeed a white board and post blocking the door of this house. Using my powers of deduction (the likes of which have rarely been seen since the days of Mycroft Holmes), I can only conclude one thing: there is evil lurking within that house, and someone DOESN'T want it to escape. I suspect it's that fire-breathing dragon that lived under The Munster's staircase. On a different note, I just had a quick scan around your "Culinary Fool" blog (conveniently located at http://spaces.msn.com/members/culinaryfool/PersonalSpace.aspx ) and WOW! Talk about a blog after my own heart! I definitely must spend some time rummaging through it...and I'd encourage all other foodies to do the same. Thanks for visiting El VTB. After so many interesting theories, I will give you mine. It is much more pragmatic. The bottles are against dogs. They are supposed not to pee on the wall if the bottle is there. At least this is what somebody told me some time ago. Of course this doesn't explain your picture. Probably in that case it is true your dragon theory. Of course, I'm not a dog...but the sight of a bottle full of water usually increases my desire to pee. After doing a little travling in Europe (alas, but not in Spain) here is my theory: Since most of the drinking water in Europe is poluted, the government probably drops off a fresh bottle to each home every day so they can shirk any responsibility of anyone getting sick from drinking the local water. Each family must ration it out over the course of a day. I have just come back from a week in southern spain and been left pondering the same question. Have been told by friends that they disuade cats, prevent lightning and assist the thirsty traveller. Please can someone put us out of our misery. I also saw a similar thing in Palmers Green - five evian bottles on top of a flat roof with no apparent explanation. could this be related. Evian shareholders? as far as I know... and I am Spanish... we use to put water on bottles or bags... to keep flies far from our houses. Apparently in Spain people may leave bottled water outside their front door so that during the night to catch all of the bad energy and vibes. In the morning they will pour it out into the street... ?